Fairly quick and straight-forward read. Something aimed at readers between Gone and BZRK – at least that’s what I think. I find it is a lighter BZRK just dealing with genetic manipulation rather than biots and nanobots etc.---------‘What if she won’t come with me?”‘Oh, she’ll come,’ Terra Spiker says. ‘It’s the fate of all creators; they fall in love with their creations.’The first thing I did earlier this year when I found out about this book was squee like tomorrow was never coming. If you know me then you know that whatever book Michael Grant comes out with… I. Will. Read! But seeing that Eve and Adam was written by both Michael Grant and wife Katherine Applegate, Animorphs creator and The One and Only Ivan author, then you would suspect that the book will be nothing short of extraordinary. Why shouldn’t it? 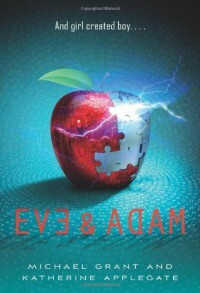 Eve and Adam was extraordinary to some degree, but that depends on how you view this book. If you read Eve and Adam expecting it to be exactly like the Gone series or BZRK or some literary wonder, then you’re not thinking straight – you’re glitched! Sure Eve and Adam is imperfect, but after all, this book explores imperfections; it’s about imperfections… and perfections. And you know what else? It’s freaking commercial!Basically the synopsis is all you need to know about Eve and Adam. What it does not say though is that it is fast-paced and you will have it down before you have even started. Having read most of Michael Grant’s work, from the first page there is this aura that immediately makes me aware that it is his writing. I did not even notice changes in the writings between Eve’s chapters (written obviously by Katherine) and Solo’s/Adam’s (Michael’s); they transitioned seamlessly. I enjoyed Eve and Adam as I do all of Michael Grant’s work, but there was this sense that they intended to write a story much too sarcastic and outlandish for its own kind. The thought that this was a “toy” for this married duo rather than a ‘I’m-taking-this-seriously-book’ was in the forefront of my mind for most of the time. But these thoughts did not influence me in anyway. I enjoyed Eve and Adam for what it was.Oh there was insta-luv, but an insta-luv I accepted. I didn’t find Eve and Adam to be heavily built upon the romance so it didn’t bother me. The romance in this book was a side dish to the main course of the science fiction elements, the genetic manipulation and engineering. Within 300 pages how else were you going to set up a relationship that was important in making the plot proceed? Solo’s character was very self-driven because of his haunting past. Once he befriends Eve and they form a relationship, he discovers more about himself and his parents as well as his role in the Spiker organisation. He feels like such a prisoner in that environment and wants to break out. To him, everything that Spiker is doing is wrong, so he attempts to save not only his own skin but the lives of others that may fall victim to the hands of the corporation – he especially wants to save Eve, who is just as lost in this new-found world and life of hers after her accident.If you want something thoroughly entertaining where suspending your disbelief is required, then Eve and Adam is the “perfect” book. If you don’t suspend your disbelief then this book is going to have a hard time convincing you as to what may happen in a future ahead of our time. After all, quite a lot of it has already happened today. Eve and Adam is farcical and you should finish it having been entertained. Or at least leave wondering why no one is staring at you since you are the most perfect and hottest being on this planet… second to Adam.Most recent thought: Eve and Adam felt like a one episode sitcom cross soap opera.